This very hot dry weather seems to have affected the wild berries. 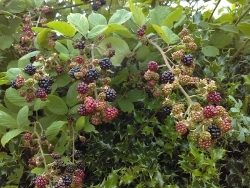 We have already started to pick our blackberries from the hedgerow, a favourite pastime with the grandchildren, and the rowan berries are ripening fast. I have spotted elderberries, hips and haws all still green but looking like there will be a good crop in the future. The welcome rain we have had at last in the middle of August has given all the berries the boost they need to bulk up and the sun has made them oh so sweet. Pies, crumbles, jams and plain simple stewed fruit are all on the menu. Enjoy nature’s bounty!